Erbil, Kurdistan Region, Iraq (cabinet.gov.krd) – Prime Minister Nechirvan Barzani received a U.S. delegation led by U.S. Assistant Secretary for the Bureau of Conflict and Stabilization Operations, Ms Denise Natali. 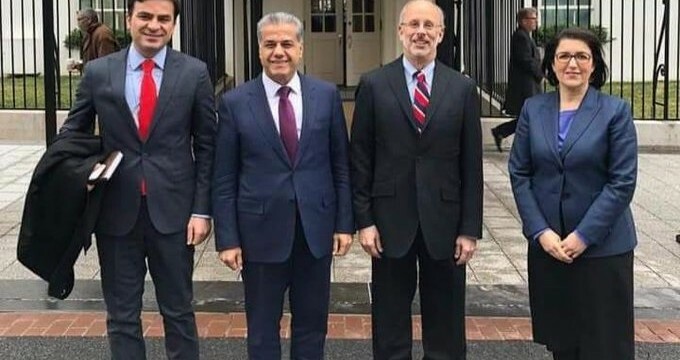 The delegation included U.S. Deputy Assistant Secretary of State for Iraq and Iran, Andrew Peek, Deputy Chief of Mission at the U.S. Embassy in Iraq Joey Hood, U.S. Consul-General to the Kurdistan Region Steven Fagin and a number of advisors and officials. The delegation praised the role of the Kurdistan Region’s Peshmerga forces in the war against terrorism, and its people and government for hosting, accommodating, and offering assistance to a large number of IDPs and refugees. They also commended the level of tolerance and coexistence among ethno-religious communities in the Kurdistan Region. They highlighted the success of the political process in Iraq and the progress made towards resolving outstanding issues between the Kurdistan Region and Baghdad. Prime Minister Barzani thanked the U.S. for its assistance during difficult times. He gave a brief about the war against ISIS and ways to eliminate its extremist ideology, and highlighted the situation of refugees and internally displaced people in the Kurdistan Region. He reaffirmed the willingness of the Kurdistan Region to resolve issues with Baghdad through talks within the framework of the Constitution of Iraq. He noted improvement in relations between the two sides. The situation of the region in general, the post ISIS era, and the development of bilateral relations were also discussed. Erbil, Kurdistan Region, Iraq (cabinet.gov.krd) – Prime Minister Nechirvan Barzani received Jordanian Minister of Industry, Trade, and Supply Dr. Tariq al-Hammouri, Jordanian Ambassador to Iraq Montaser Oklah, Consul General of The Hashemite Kingdom of Jordan to the Kurdistan Region Haitham Abu Alfoul, and their accompanying delegation. Minister al-Hammouri highlighted historical relations between the Kurdistan Region and Jordan and expressed willingness to further strengthen and develop these relations, particularly in the fields of trade and banking. He also conveyed the support of His Majesty King Abdullah II of Jordan and his government to the Kurdistan Region. Prime Minister Barzani thanked His Majesty King Abdullah II for his support to the Kurdistan Region during difficult periods, and expressed the willingness of the Kurdistan Region to strengthen relations with Jordan, particularly in the economic field. He hoped that Jordanian businessmen would take advantage of investment opportunities in the Kurdistan Region. The post ISIS situation in the region and the crisis of displaced persons in the Kurdistan Region and refugees in Jordan were also discussed. They also stressed the eradication of terrorism through coordination among the countries of the region and the international community. Washington, DC, USA (us.gov.krd) – Minister Falah Mustafa, Head of the Kurdistan Regional Government (KRG) Department of Foreign Relations, met with Deputy National Security Advisor Dr. Charles Kupperman, rounding out a week-long visit to Washington to meet with senior US Administration officials, members of Congress, and business leaders. Minister Mustafa and KRG Representative to the United States Bayan Sami Abdul Rahman met Dr. Kupperman at the White House on Friday, to discuss a range of pressing issues facing Kurdistan and Iraq. On the same day, the delegation met with two senior State Department officials, Deputy Assistant Secretary for Democracy, Human Rights, and Labor Roger Carsten; and Special Advisor for Religious Minorities Knox Thames. They also traveled to the Pentagon to meet with Kathryn Wheelbarger, the Acting Assistant Secretary of Defense for International Security Affairs. Erbil, Kurdistan Region, Iraq (cabinet.gov.krd) - Today, Regional Council for Oil and Gas Affairs has published new verified data on the Kurdistan Region’s oil exports, consumption and revenues, covering the period from 1 July 2018 to 30 September 2018, after a review of the sector by the international “Big 4” audit and consulting firm, Deloitte. The Regional Council for Oil and Gas Affairs acknowledges the positive feedback received from stakeholders, including the international community, and reiterates its commitment to the people of Kurdistan that the two international audit firms, Deloitte and Ernst & Young, will continue to independently review the oil and gas sector, inclusive of all the streams. Deloitte’s report for the third quarter of 2018 is accessible through this link (PDF), in Kurdish, Arabic and English. Frequently asked questions handbook (PDF) in Kurdish, Arabic and English to help readers better understand different sections of the report. Erbil, Kurdistan Region, Iraq (cabinet.gov.krd) – Prime Minister Nechirvan Barzani received former President of France François Hollande. The meeting was also attended by Kurdistan Regional Government Deputy Prime Minister Qubad Talabani. President Hollande gave a briefing on his visit to Mosul and his participation in the Shifa Gardi International Award Ceremony. He recalled his earlier visits during the fight against ISIS and visiting the frontlines with President Masoud Barzani. He praised the Kurdistan Regional Government and Peshmerga forces for protecting, accommodating, and offering assistance to a large number of displaced people. He also stressed the importance of coordination between the international community, Iraq, and the Kurdistan Region to provide essential services to devastated areas. Prime Minister Barzani thanked President Hollande and France for continued support to the Kurdistan Region, especially during difficult times. He highly valued the role of France in assisting the lifting of the blockade on the Kurdistan Region, imposed by Baghdad after the independence referendum, in the end of 2017. He also highlighted progress in relations between the Kurdistan Region and Baghdad toward resolving outstanding issues through negotiation. He reaffirmed KRG’s support to Iraqi Prime Minister Adil Abdul-Mahdi. Further, he pointed to current talks on planning coordination between the Iraqi army and Peshmerga forces in confronting the threats of reemergence of terrorism. Erbil, Kurdistan Region, Iraq (dfr.gov.krd) – Head of the Kurdistan Regional Government (KRG) Department of Foreign Relations (DFR), Minister Falah Mustafa participated in conference discussions of cooperation between the Kurdistan Region and Netherlands on the agriculture, food security and investment sectors under the theme “farm to the plate” which organized by Consulate General of the Kingdom of the Netherlands in the Region and under the patronage of the Netherlands Ministry of Foreign Affairs. The conference also attended by the KRG Deputy Prime Minister, Qubad Talabani and Consul Generals in the Kurdistan Region and Representatives of the public and private sectors of the Kingdom of the Netherlands in Erbil, Willem Nicolaas Cosijn, along with a number of Ministers, Governors and KRG Officials. In his opening remarks, Consul General and Representative of the public and private sectors, Mr Cosijn welcomed the participants and expressed his optimism for further development and progress of relations between the two countries. He also emphasized on the importance of revitalizing the agricultural sector, industry and developing a sustainable and strong economic infrastructure in the Kurdistan Region. In his remarks, Head of DFR, Minister Falah Mustafa highlighted the historical relations between the Kurdistan Region and the Kingdom of the Netherlands. He also thanked the people and government of the Netherlands for their support to the Peshmerga Forces in fighting against ISIS, also, co-operation in mine clearance and humanitarian assistance to the refugees and displaced persons in the Region. Minister Mustafa addressed that the conference took place as a result of growing ties between the two countries and referred the efforts to raise the efficiency of agricultural production in the Kurdistan Region and improve it in terms of quality, food security, soil protection, and water resources. “We are welcoming companies and foreign investments that are interested in investing and enhancing collaboration and effective implementation of the projects in the Kurdistan Region” Minister added during his statement at the conference. Erbil, Kurdistan Region, Iraq (cabinet.gov.krd) – In 2018, only 32,000 of approximately 1.5 million remaining internally displaced persons, IDPs, and Syrian refugees in Kurdistan Region have either returned to their homes or migrated abroad. In an interview with the Kurdistan Regional Government website, Director-General of the KRG Ministry of Interior’s Joint Crisis Coordination Centre, JCC, Hoshang Muhammad stated that in 2018 only 27,671 IDPs and 4,380 Syrian refugees left the Kurdistan Region. This low number is mainly due to continued security challenges, terrorist activities, and inadequate basic services in their liberated places of origin, and, in Syria, it is due to ongoing war and economic collapse. During 2018, IDPs and refugees continued to flee their homes; 28,487 IDPs, mostly from Nineveh province, and 3,795 refugees from Syria sought refuge in the Kurdistan Region. • 79 percent of IDPs reside in cities and towns and 21 percent in 29 camps. • 69 percent of Syrian refugees reside in cities and towns and 37 percent in nine camps. • 50 percent of IDPs plus refugees are in Erbil province, with 31 percent in Duhok and 19 percent in Suleimaniya provinces. Providing services, such as security, shelter, water, electricity, health, education, and camp management, requires $5.4 million per day ($162 million per month or about $1.9 billion annually). The KRG has endeavored to make services available equally for IDPs and refugees, despite severe financial constraints. Regarding international assistance, Mr. Muhammad stated that during the past four years, UN agencies along with local and international NGOs have been providing highly valued support to the KRG in caring for an extraordinary number of IDPs and refugees. He said, to meet the needs of IDPs and refugees, NGOs along with the international community provide only about 25 percent of requirements while the KRG provides 75 percent. JCC Director General further said that since victory over ISIS was declared, the number of international organizations, especially those servicing camps, have decreased, which has caused drop in services. Currently, 160 humanitarian organizations serve in the Kurdistan Region to help IDPs and refugees – 43 are local and 103 international NGOs, 14 are UN agencies. According to JCC data, in addition to 249,639 Syrian refugees in the Kurdistan Region, other refugees include 20,575 from Turkey, 13,162 from Iran, and 756 Palestinians. Erbil, Kurdistan Region, Iraq (dfr.gov.krd) – Head of the KRG Department of Foreign Relations, Minister Falah Mustafa met with the Ambassador of Spain to Iraq, Juan José Escobar Stemmann and his accompanying delegation on 9 February 2019. Minister Mustafa provided an overview of the recent political developments in the Kurdistan Region and beyond, the formation of the new KRG cabinet and pathways to foster bilateral relations between the Kurdistan Region and Spain. The Minister also expressed the commitment of the KRG to develop ties and improving economic cooperation with Spain. Spanish Ambassador, Stemmann expressed his optimism on visiting the Kurdistan Region and meets with the KRG officials, as well as to further strengthening relations in various areas including economic and trade. 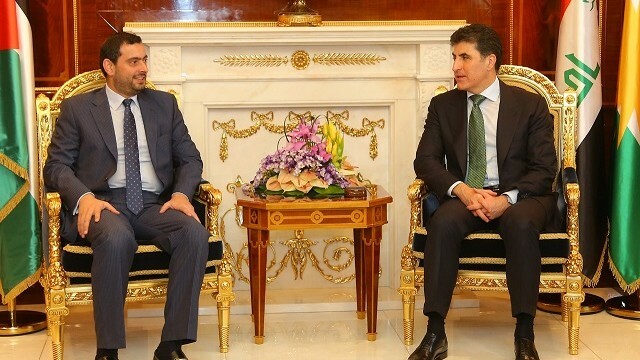 Erbil, Kurdistan Region, Iraq (cabinet.gov.krd) – Prime Minister Nechirvan Barzani received Consul General of Kuwait to the Kurdistan Region, Omar Al-Kandari and his accompanying delegation. Consul General Al-Kandari highlighted Kurdistan Regional Government’s effective management of the past four year’s severe economic crisis and accommodating and assisting an extraordinary number of displaced persons from Iraq and refugees from Syria. He also noted his country’s assistance to displaced persons. Prime Minister Barzani thanked the people and Government of Kuwait for their humanitarian assistance with special gratitude to the Emir of Kuwait and the Consul General. Relations with Baghdad, including the recent visit of Prime Minister Barzani to Baghdad and his meeting with Iraq’s Prime Minister, relations with neighboring countries, strengthening relations between the Kurdistan Region and Kuwait as well as political and security situation of the wider region, were also discussed. 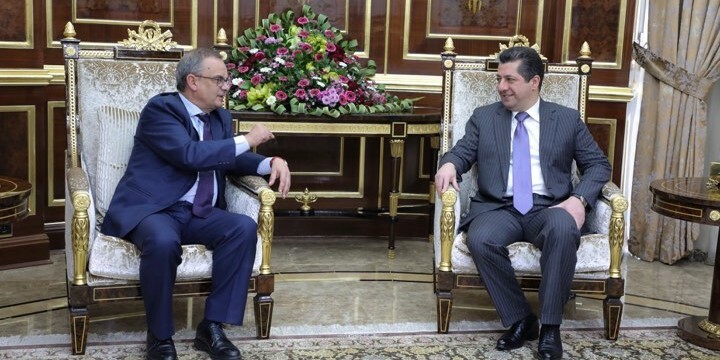 Erbil, Kurdistan region of Iraq – Spanish Ambassador to Iraq, Juan José Escobar Stemmann, visited the Kurdistan Region on Saturday and met with KRG leaders to discuss relations between Kurdistan Region and Spain. The Ambassador Escobar Stemmann was accompanied by the Honorary Consul in Erbil, Dawood Sardar Jaff during his visit. The Ambassador met with the Chancellor of the Kurdistan Region Security Council (KRSC), Masrour Barzani. Both sides discussed developing bilateral relations and cooperation in all areas, especially in trade and investment. Later, the Ambassador of Spain met with the Head of DFR, Falah Mustafa, and discussed the possibilities to develop trade between Spain and the Kurdistan. The recently improving relations between the KRG and the federal government of Iraq were also discussed at the meeting.